≪Top Fruit≫, referring to the characteristic inverted cone or top-shaped fruit of the species in this genus. A genus of very small plants, globose flattened to elongated, neotenic, usually solitary, but some may produce clusters. Ribs absent, divided into low tubercles, rounded to conical or deltoid. Areoles situated at the end of tubercles, often woolly, white, axils shallow. Spines usually few, flexible, slightly sharp or not at all. Flowers diurnal, self-sterile, appearing at the apex of stems, funnel-shaped, usually white to creamy white, yellowish, pinkish to magenta or purple, pollinated by insects, usually bees and flies. Fruits like berries, top-shaped, with variable dehiscence according to species. Seeds rough to granular, tuberculate, black, with a large hilum. 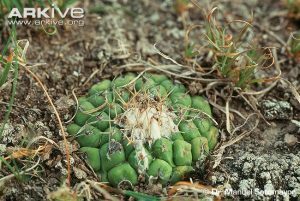 The genus Turbinicarpus is endemic to Mexico, and grows very mimetically, among grasses, bushes and shrubs, often almost completely buried, on small hills or in mountains, on various rocky or gravelly soils, usually limestone, also clayey (T. polaskii), granite (T. swobodae), gypsum (T. hoferi), humus (T. pseudomacrochele), or even on dry salt lakes (T. Iophophoroides), on shale cliffs (T. alonsoi), always in small localized colonies, in crevices and cracks of rocks where pockets of humus are found, between 800 m and 2600 m in altitude. Populations exhibit an extreme geographic variability. Mexico (Coahuila, Guanajuato, Hidalgo, Nuevo Leon, Queretaro, San Luis Potosi, Tamaulipas, Zacatecas).